Last June was the biggest month in comics in 20+ years, thanks to Rebirth and Civil War II — and the fifth week giveth, the fifth week taketh away. Pick your explanation, but the totals were very definitely down in June 2017, according to a report issued this morning by Diamond Comic Distributors. Comichron's analysis puts comic shop orders of comic books, graphic novels, and magazines at $46.09 million in the four-week month, down considerably from last year's record $58.59 million in a month with one additional shipping week. The comparative was always going to be extremely hard to beat, which is why we warned you about it early. The news isn't all dire, so let's hit the brighter spots first: Under the hood, if you divide sales by the number of weeks in the month, the individual weeks in June were the strongest all year to date. That $46.09 million divides to $11.52 million per shipping week, the highest total since October. The second quarter beat the first quarter this year by 7.84% — as it should in any kind of normal situation — and 2017's new comics units so far, though infused with overship and 25-cent Image copies, are up from the year-to-date last year by 2.56%. On the other hand, that's the only category that's up for the year. Comics dollars are slightly off, and combined comics, graphic novels, and magazines stand at $261.18 million for the year, off from $280.16 million in the more editorially front-loaded 2016. We were off even more, though, by this time in June 2011, and DC's New 52 relaunch brought the market almost to even by the end of the year. The big laggard this year continues to be graphic novels, possibly in part a reflection of a weaker fall and winter last year for new releases, since now is when those comics are being collected. There may also be a dynamic of retailers keeping their powder dry, as July has a heavy release slate coming. Flying Colors' Joe Field tweeted yesterday about the challenges involved with ordering for July. 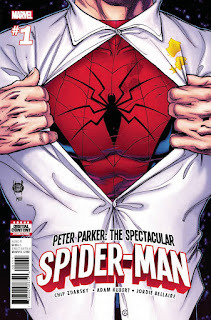 Marvel's Peter Parker, The Spectacular Spider-Man #1 led the new comics charts, a month in advance of the successful Spider-Man: Homecoming movie launch. DC's number of new comic-book releases rose quite a lot over the Rebirth-shortened slate from last June, while Marvel's dropped. So it's not a good report in comparison with last June, and that was completely expected — and in general, the first half of 2017 winds up looking a lot like the first half of 2011 before the New 52, or the first few months of 2016 before Rebirth. It'll still be a while yet, however, before we see whether Marvel's Legacy initiative makes a difference. We do know the market overall did well last year according to our just-released joint report with ICV2, with book channel up more than the Direct Market is off so far this year; it'll be interesting to see whether that market has been unaffected by the slowdown in graphic novels in comics shops. Check back here Monday for the sales estimates for the month. It'll be my 250th consecutive monthly report — haven't missed a month yet! Congrats John! 250 consecutive months... that's insane! ;) Thanks for providing these each month, very much appreciated and the comicbook industry never ceases to fascinate me!